CG fluid, especially “SPH” fluid (smoothed particle hydrodynamics), suffers from inaccurate physics at the microscopic level, at the scale of individual particles making up the fluid. Even when simulating with very large particle numbers, this becomes a major problem wherever the fluid becomes splashy since it forms thin sheets and strings — or rather, it should form thin sheets and strings, like we see in real water. Hi-speed macrophotography of fluid spashes classically show how delicate, impossibly thin and continuous sheets of fluid fly thru the air and stay coherent for prolonged periods. These produce tiny droplets and hair-like strings of fluid from their margins but otherwise hold together for a long time, before they eventually and suddenly burst apart. CG fluids on the other hand always break apart immediately, forming very unattractive and distinctly un-real cheese-like holes and webbing, never holding together in thin sheets. 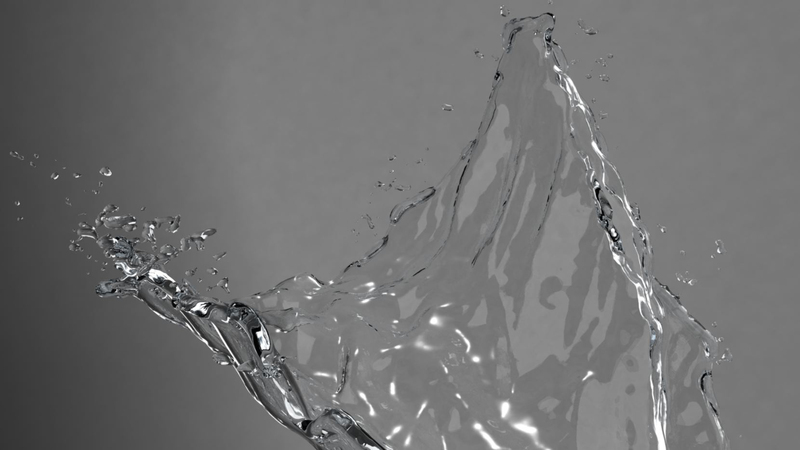 This has generally been the limit of CG fluid applications, and is what drives studios to have expensive table-top practical shoots, since CG fluids simply haven’t been able to reproduce the very particular small-scale features of real fluids — until now. The movies below show recent r&d results from Fusion CI Studios that demonstrate a new technology for controlling the breakup of cg fluid, allowing us to simulate exceedingly thin, naturally organic fluid splashes. This is what typically happens with cg fluids when you try to form thin sheets. In this sim we emit a thin sheet of fluid and bend it into a circular flow using a simple vortex force. It develops holes and breaks apart into small clusters of particles almost immediately. When we apply our new dynamic hole-filling technology, the fluid stays as a fully coherent sheet for as long as we want. No holes! The method hunts for holes as they start to form, and fills in the gaps with new fluid. The key to this working is that the fluid insertion is done very precisely, so the simulation stays extremely stable. How effective and how stable is this? We tried to break it — we simulated a fluid sheet being bashed violently by noise forces. This movie shows the meshed fluid, with almost no holes and running entirely stably. Now let’s take it a step farther. Here’s 3 splashes, similar to classic hi-speed photography elements of water or paint. They form thin sheets and we add tiny streamers off their edges. Compare these to splashes of paint shown on stock element sites such as Getty Images. In the right-most element, we’ve applied randomness controls on the streamers and turn down the efficiency of the hole-infilling at different times for the inner sheet of the splash versus the outer streamers, so they break apart at different times (streamers first, then the sheet). These splashes are very delicately structured, down to the smallest level of detail available to the simulation — the streamers and the sheet of fluid are all just 1 layer of particles thick. Since we can simply set the size of particles, this means we can make the fluid sheets as thin as we want. There’s no jerky motions due to the pollyfilla process, it’s as smooth as silk. Just to emphasize that the results are very high quality visually, the link above is an example of one of the splashes meshed and ready for render. The mesh is smooth and shows no signs of jitter during motion. The smorganic process is turned off toward the end, allowing the SPH fluid to do what it usually does: break up. This was done to emulate the catastrophic disruption of such thin fluid sheets, that happens in nature when surface tension forces finally take over the fluid motion. We helped the disruption along by kicking the fluid with a strong noisy force field. 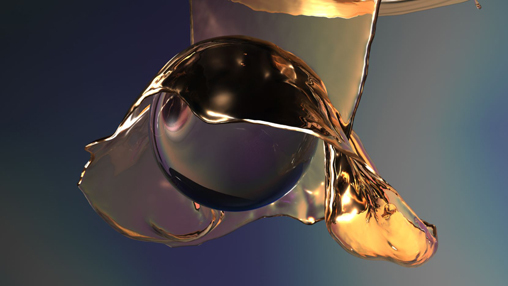 The image below is a render of a simulation of pouring “honey”, where we’ve set smorganic to disallowo any holes in the fluid. The results show the smoothness of the resulting meshes despite the high-spec, high-refractive nature of the shader and lighting, and despite a hard impact with a rigid body. rd impact with a rigid body. Fun with a tennis ball canon aka rigid body dynamics! Your R&D is one of the biggest inspirations at least for me… keep it up the awesome work.